Heading into the full weekend slate of Week 9 of the NFL season, take a look back at, to this point, the highest graded safeties across the entire league. With three players playing at ‘elite’ levels, these individuals make huge impact game-in and game-out, and should be watched this weekend. PFF Elite Stat: Smith has seven quarterback pressures this year which is good for an NFL-leading 33.8 pass-rushing productivity score among safeties. There’s really no better do-it-all safety in the NFL right now than Smith. On top of his pass-rushing prowess, Smith leads all safeties with an 89.6 run defense grade. He’s made eight solo run stops, good for a run stop percentage of 6.6 percent when lined up in the box. He’s just as good in his coverage, where his 90.8 grade ranks second. He surrenders a mere 0.16 yards per coverage snap (seventh-lowest among safeties with 100 snaps) and has three interceptions and two pass defenses. Quarterbacks throwing at Smith have a passer rating of just 11.2. PFF Elite Stat: Amos is allowing only 0.21 yards per coverage snap, the 11th-best mark among safeties with at least 100 coverage snaps. 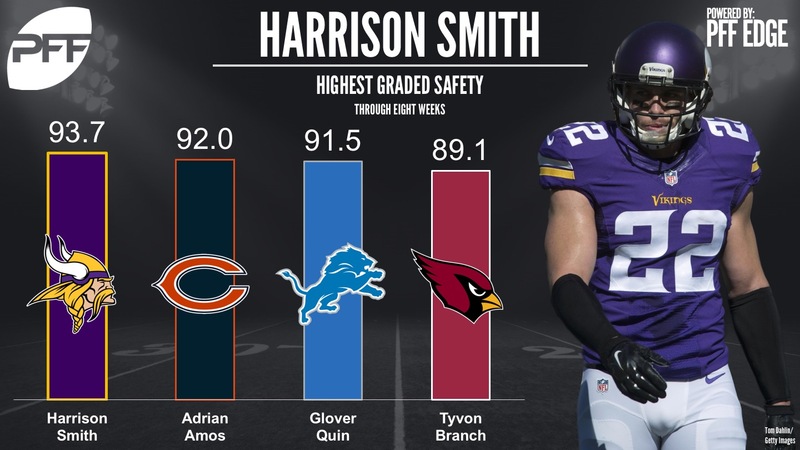 Amos leads all NFL safeties with a coverage grade of 91.4 this season. Despite being one of the most frequently targeted safeties in the league at once every 11.5 coverage snaps on average, Amos has surrendered a first down or touchdown on just 27.8 percent of his targets. That’s the sixth-lowest mark among safeties with at least 10 targets. He’s allowed just 41 yards on 13 catches in coverage this season, with a mere 19 of those coming after the catch. His 17 solo stops are the sixth-most in the NFL this year among all safeties. PFF Elite Stat: When lined up within eight yards of the line of scrimmage (41.1 percent of the time) Quin has a run stop percentage of 11.9 percent, second-best among safeties with at least 100 run snaps. It’s the run game where Quin has shined the brightest this season, his 88.1 run defense grade ranking fourth in the NFL among safeties. He has nine total run stops this year, eight of which have come when he lines up within eight yards of the line of scrimmage. Quin has played 166 run defense snaps this season and has received a negative grade on just 1.8 percent of those snaps, the sixth-best mark among safeties with at least 100 run defense snaps. He’s no slouch in the passing game either, with three interceptions and a sixth-best coverage grade of 89.2. PFF Elite Stat: Branch has the third-best run stop percentage among safeties in the NFL this season at 7.3 percent thanks to a safety-best 14 run stops. Branch is the Cardinals new-age hybrid player having lined up at 19 different positions this year, anywhere from outside corner to inside linebacker. He’s a fantastic run defender, having played 196 run defense snaps this season and received a positive grade on 8.7 percent of them, the second-best percentage in the league. Branch also has no problems dropping into coverage either as evidenced by his ninth-highest coverage grade of 87.6 this season. He’s allowed a first down or touchdown on just 27.3 percent of the time he’s targeted. PFF Elite Stat: Hyde is allowing 0.42 yards per coverage snap, the 26th-best mark among safeties with at least 100 coverage snaps this year. Hyde has been a playmaker for the Bills this season at safety, consistently helping his defense out with huge plays. His coverage grade of 90.6 ranks third in the NFL and he leads all safeties with five interceptions. He also has four pass breakups, the third-most among safeties. He’s missed just one tackle this season and his 3.1 yards after catch allowed average is one of the lowest in the NFL. He’s very efficient against the run too, having received a negative grade on just 1.27 percent of his run defense snaps. PFF Elite Stat: Byard has made six solo run stops when lined up inside the box, a top-25 mark among all NFL safeties. If Byard hadn’t missed seven tackles this season he would likely be much higher on this list. His run defense grade of 84.7 and coverage grade of 86.6 both rank in the top eleven among safeties. While Byard has allowed 15 catches and three touchdowns, he’s also made four interceptions and has three pass breakups. He allows a first down on a mere 30.4 percent of the times he’s targeted, even more impressive considering he’s the 16th-most frequently targeted safety in the league. PFF Elite Stat: Poyer is allowing a mere 0.58 yards per coverage snap this season, to go with 18.5 coverage snaps per reception allowed. Poyer joins his teammate on this list thanks to an identical third-best 90.6 coverage grade this season, making himself and Hyde the best coverage safety duo in the entire NFL. While Hyde’s nine playmaker plays (interceptions + pass breakups) leads safeties, Poyer is right behind him with seven (two interceptions and five pass breakups). He allows a first down on just 35.3 percent of his targets, and surrenders just 3.6 yards after catch per reception. PFF Elite Stat: Thomas is averaging 30.3 coverage snaps per reception this season, the 27th-best mark among all NFL safeties. A year after his tough injury, Thomas is back to being one of the most-feared safeties in the league. Teams will routinely avoid the middle of the field to stay away from Thomas, preferring to take their chances on the boundaries and the short game. Thomas has an 89.1 coverage grade, which is the seventh-highest among safeties this year. Opposing players have gained a first down or touchdown just 18.8 percent of the time they’ve gone against Thomas, the third-lowest percentage in the NFL. Thomas hasn’t made a huge impact in the run game this year, but isn’t damaging his team either as he’s received a negative grade on just 1.8 percent of his run defense snaps. PFF Elite Stat: Bethea has missed just one tackle this season, out of 32 attempts, the fifth best-mark among safeties with at least 100 snaps. While teammate and safety partner Tyvon Branch lines up everywhere, Bethea is much more of the deep safety for the Cardinals. It’s a big reason why he’s only been targeted nine times in coverage. He’s allowed six receptions but his three interceptions and one pass breakup help counter those out. Bethea has made seven solo stops this season and he’s received a positive run defense grade on 4.3 percent of his 116 run defense snaps. PFF Elite Stat: Chancellor has the sixth-best run stop percentage among safeties at 6.1 percent thanks to 10 solo run stops this season. To the surprise of nobody, Chancellor is still one of the best run defending safeties in the NFL. He has an 81.8 run defense grade, and has graded positively on 7.1 percent of his 168 run defense snaps, the fifth-highest percentage among all safeties. Chancellor has also been good in coverage this season, allowing just 12 catches on 25 targets as the primary coverage player. Only 28.0 percent of his targets have gone for first downs or touchdowns, and his coverage grade of 86.4 ranks 11th in the NFL among safeties.